Before you start getting your students involved in your class blog, you’ll need to establish some rules and guidelines, since one of your main aims is, after all, to educate your students on how to interact responsibly online. While we all grow up with technology in this day and age, this does not necessarily mean that everyone knows how to post appropriately online. A quick look at a typical Facebook wall should be enough to showcase that fact. Your class blog needs to set a good example from the outset, and your students must be encouraged to behave appropriately online. For the privacy and wellbeing of both yourself and your students, it is particularly important to set strict rules with regards to the type of personally identifiable information which people can and cannot post. You’ll probably want to decide on the most important rules and guidelines for your blog yourself, but there’s no reason why it shouldn’t become a class activity in itself. Your students, their parents and other readers should only be identified by their first names in posts and comments. Additionally, no personally identifiable information, such as street addresses, phone numbers and email addresses should be made public. All comments and posts submitted by your students will be reviewed by yourself or another moderator before they get published on your blog. Students should proof-read their comments and posts carefully to avoid spelling and grammar errors and other issues. Additionally, in order to maintain clarity and professionalism, students should be discouraged from using acronyms, emoticons and other features which tend to be used in text messages and instant messaging programs. Students should stay on topic when commenting on your blog posts, while also being conscious about what they post. The last thing you want is for the comment section for a particular post to devolve into a flame war. Your blog rules and guidelines should ideally include some general online safety and privacy guidelines as well. In addition to creating posts, which will gradually get lower down the page to the point of being archived as your blog grows, WordPress also allows you to create static pages. These pages are typically accessed by permanent buttons or menus located beneath your blog’s header image or in a sidebar. Publishing your blog rules and guidelines on a page rather than in a post will make them easier to find. In addition to having a rules and guidelines page, you may also want to have a separate “About our Blog” page. To create a new page, navigate to “Pages > Add New” in your administrator dashboard. Enter a title and the content for the page, and publish it exactly as you would a normal post. You’ll then need to set up links to your new page, though some themes do this automatically by adding links in the header area. 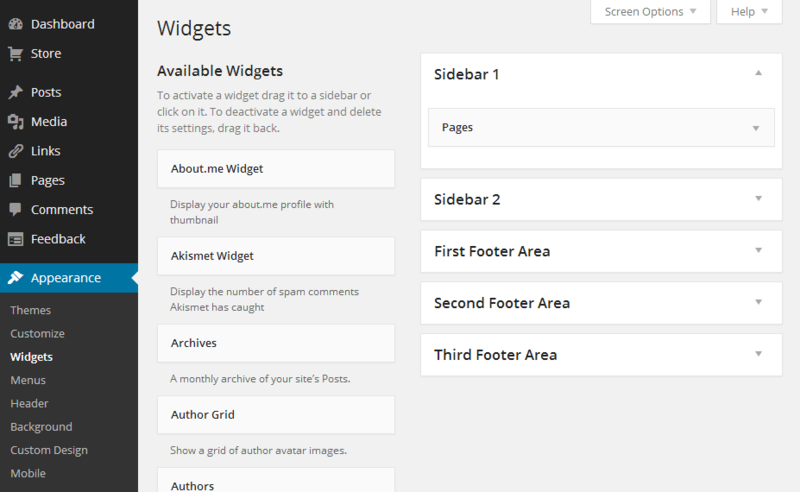 In other cases, you can add the Pages widget to your sidebar. To add a link to your page in the sidebar, navigate to the “Appearance > Widgets” section, and drag across the “Pages” widget from the available widgets to the left to the widget area (such as Sidebar) to the right. Enter a title for the widget if you wish, and click “Save”. Links to your blog’s pages, including the Rules and Guidelines page, will now appear permanently on your blog. Commenting on a blog post is a very quick and straightforward process, and by default, commenting is enabled for all posts and pages that you create. To leave a comment, you’ll need to open your blog and click on the preview of the post which you want to comment on to open the full version. Scroll down to the bottom of the post until you see the “Leave a Comment” (the exact wording may vary depending on your currently active theme) section. Simply write the comment and click “Post”. New commenters will, by default, be asked to enter their name and email address to submit the comment, however, the address and full name will not be made public. By default, comments will only be posted without moderation if its author has already had a comment approved previously. However, since you are operating a class blog, you’ll likely want to moderate all comments before they are published. 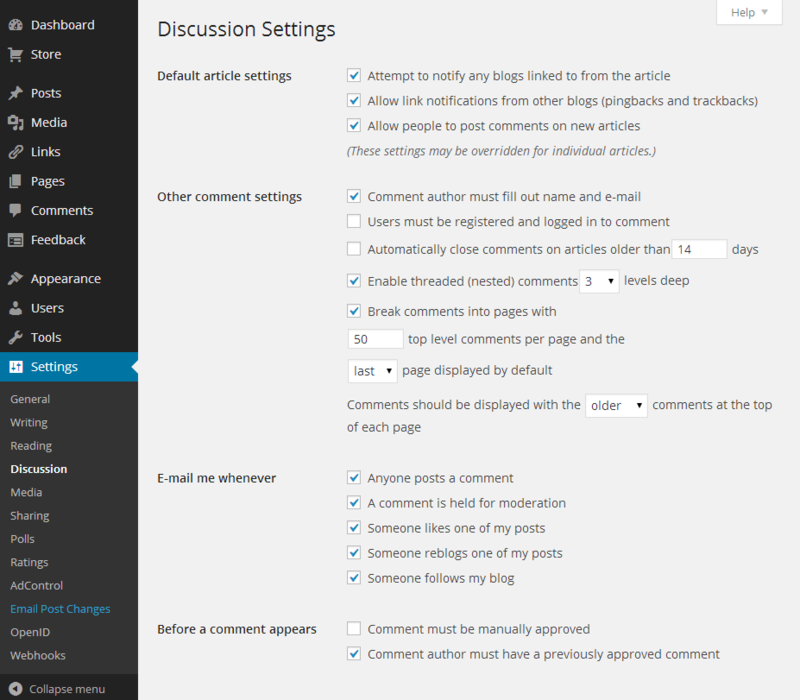 In the WordPress administrator dashboard, navigate to “Settings > Discussion” and check the box beside “Comment must be manually approved” before clicking “Save Changes” at the bottom of the page. You can manage, delete and approve comments from the “Comments” section in your dashboard. You can also disable comments for specific posts and pages, and you’ll probably want to do this for your Rules and Guidelines page. Navigate to “Pages > All Pages,” mouse over the page and click “Edit”. Click the “Screen Options” button in the top-right and check the box beside “Discussion”. Scroll down the page, and uncheck the box beside “Allow comments”.